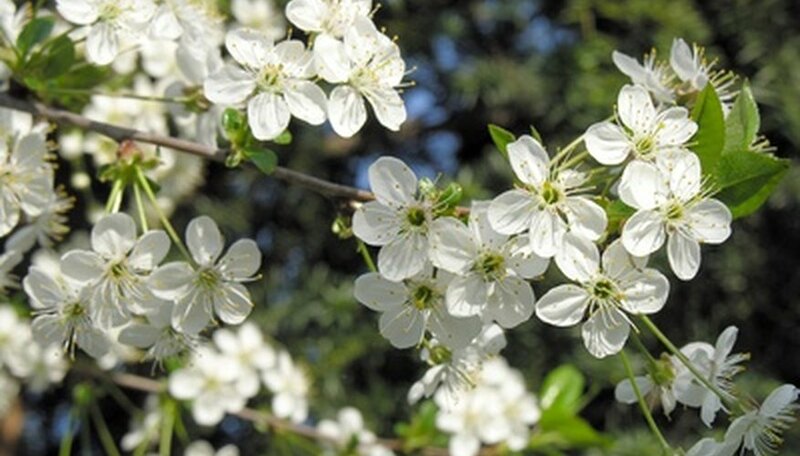 The damson plum is a deciduous fruit tree with a moderate growth rate. This tolerant tree thrives in many soil types and can withstand strong winds. The damson is self-fertile and requires very little pruning. It is resistant to most pests and diseases but is susceptible to a few diseases that can be harmful and injurious to the tree, if left untreated. Powdery mildew is caused by fungal spores which develop during the cool, wet periods of spring and survive in dormancy throughout the winter months. Wind and rain transport the fungal spores onto the damson plum tree, causing an infection that is initially cosmetic. Infected trees will display small grayish white spots on the surface of the foliage. As the disease progresses, the spots coalesce to develop a whitish fungal covering across the leave’s surface. Severe infection also causes growth stunt, foliage distortion and fruit damage. The disease is best prevented by keeping the damson’s area free of defoliated debris. Fungicidal treatments designed for powdery mildew are effective in reducing the symptoms of the disease. Verticillium wilt is a soil-borne fungal disease that can live for many years in the soil without a host. This fungal disease infects the damson plum tree through its root system and causes distress to the tree’s vascular system. The damage to the vascular system inhibits the tree’s ability to transport water and nutrients throughout the tree. As a result, infected trees will display symptoms such as wilting and curling of foliage, yellowing and browning of foliage, dieback, growth stunt and droop. The infected tree may also experience severe and early defoliation. The symptoms of verticillium wilt mirror other common tree diseases and may be difficult to identify. An inspection of an infected branch will display an internal discoloration such as an internal ring or streak. There is no cure for verticillium wilt. Severely infected damson trees should be removed and destroyed. Bacterial spot is a disease that develops within the scars of the tree that are produced during defoliation. Promoted by water, the bacteria produces rapidly during the cool, wet periods of spring. The bacterial spot disease infects the foliage, fruit and twigs of the tree. The infected areas of the tree develop small, purplish-black spots on the surfaces of the fruit and foliage. As the disease progresses, the infected areas become water-soaked and develop into dark, sunken lesions. Severely infected foliage will begin to defoliate and fruit becomes useless. Prune infected areas from the tree with sharp, sterile shears that are sterilized between each cut. Bacterial treatment sprays are effective in reducing the symptoms of the infection. Combine chemical treatments with pruning for the best results.